Uganda tourism board (UTB) the body which is responsible for tourism in the country is organizing a charity walk ahead of this year’s Martyrs’ day. The walk is scheduled to take place on 1 June and all proceeds will go the Uganda heart institute. Every participant is expected to contribute Ushs. 30,000 to this cause. UTB is hoping that the proceeds from the walk can save the lives of at least 200 children with heart disease. The goes to show that that the tourism body cares about a lot more than tourism and safaris in Uganda. The well being of the people is also very important to them. The target is that UTB is hoping to achieve from contributions from the participants is US$ 200,000 which hopefully will be enough to help 200 children. Heart disease is quite common among children in Uganda. Of the 1.6 million babies born every year in Uganda, about 16,000 are born with heart defects yet many parents cannot accord the treatments and operations necessary to keep their children alive. On average a heart operation costs US $ 1000, which is too expensive for the average Ugandan. Only about 3% of the parents of these 16000 children can afford to have their children treated. The walk which will be retracing the footsteps of the Uganda martyrs will have it starting point at Old Kampala secondary school, then on to St Matia Mulumba church which is known as the place where the oldest martyr was killed, and then on to Rubaga road where jean Marie Musoke was killed. the next stop will be Mengo, once known as Nkaawo where the Buganda Katikkiro’s office and residence were once located, it is also the land that Kabaka Mwanga gave to the missionaries. From Mengo the walk will continue to Busega. Busega is where the bodies of the first martyrs were dumped. The walk will start at 8.00am. While the walk is in remembrance of the Uganda martyrs and a chance to uniquely re-visit Uganda’s history, it is an opportunity for Uganda tourism Board to promote religious tourism. 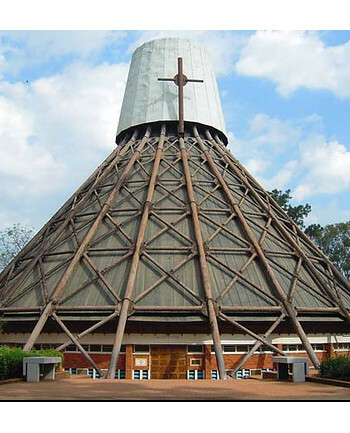 The Uganda Martyrs Shrine attracts many pilgrims and tourist as a site of religious importance. A few tourists on Uganda safaris sometimes take time to tour important sites in the capital Kampala and the shrine is one of the sites they visit. Registration for those interested in participating in the 1 June walk is going on at the UTB offices at the National Theater, Garden city, Kololo, and at Entebbe International Airport.